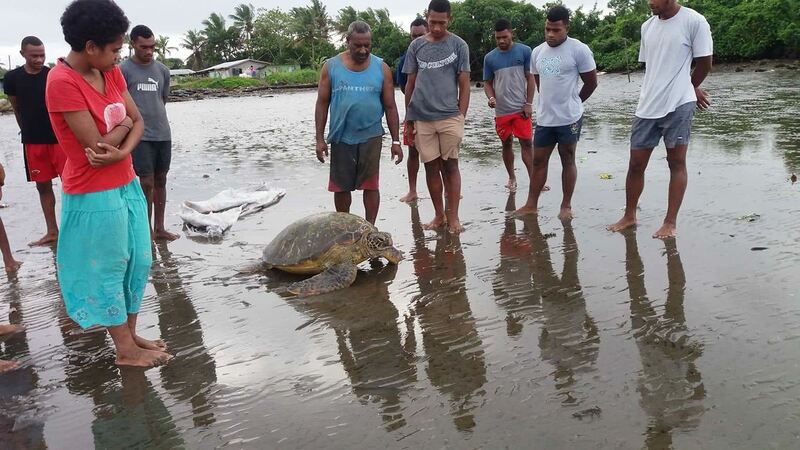 An endangered Green Turtle (Chelonia mydas) was released by villagers of Kinoya early Tuesday morning thanks to the quick action and advice given by Mr Apisai Tinakoro, a former staff of the National Trust of Fiji and Mr Amini Vakalala, a civil servant with the Lands Department. The green turtle or vonu dina was caught by fisherwomen on Monday morning who had brought the turtle into the village to be eaten but were wary of the current ban on turtles and sought advice on whether to consume the turtle. “I knew the moratorium was still in place and I advised them against it,” said Mr Apisai Tinakoro . “It was a large Green Turtle, a female and I knew it was endangered and asked to save it, the Green Turtle was kept at my home for the night before it was released in the morning.” Mr Tinakoro said. 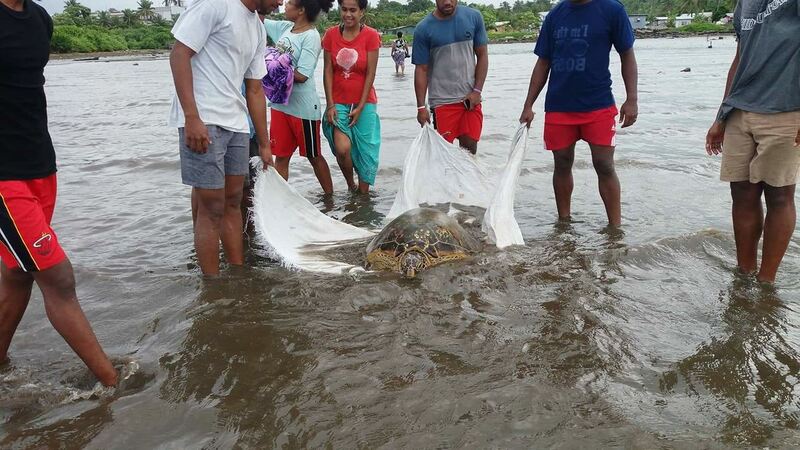 Mr Tinakoro added that as a former staff of the National Trust of Fiji 15 years ago, he was part of the first round of awareness workshops that focused on saving turtles on Yadua Island prior to the creation of the moratorium. His nephew Mr Amini Vakalala added that he had also sought advice from WWF’s Fisheries Project Officer Mr Laitia Tamata, who had informed him that the current 10 year ban on harvesting of sea turtles was still in effect which further strengthened his support towards advising the community fishers to release the large female green turtle. “I am happy that the green turtle was released and that we allowed the turtle to survive,” Mr Vakalala said. He added that support for the moratorium is gaining support through awareness and that the moratorium should remain. WWF’s Conservation Director Mr Francis Areki was appreciative of the duo’s heroic efforts towards saving the green female endangered turtle. Under the International Union for Conservation of Nature (IUCN) Red List for threatened and migratory species, seven marine turtle species are listed and these are the Hawksbill, Leatherback, Kemp’s Ridley turtle, Green turtle, Loggerhead Turtle, Olive Ridley turtle and the Flatback turtle. Out of the seven, Fiji has five sea turtle species and these are the Hawksbill (Taku), Leatherback (Dakulaca), Olive Ridley (Vonu Damu), Green Turtle (Vonu Dina) and the Loggerhead (Tuvonu) whose status are either critically endangered or endangered. Marine turtles play a key role in the marine ecosystem by maintaining the health of sea grasses and coral reefs. With support from WWF, the Ministry of Fisheries is conducting a series of meetings for Government, NGO and partners and stakeholders directly involved in Sea Turtle Conservation work across the four divisions to discuss the end of the moratorium with a view to next steps. This started in the North last week and in the western division this week. “With these series of events happening at the stakeholder level, the release of the green turtle in Kinoya village is a very promising sign and is an example to other communities that are known to still harvest turtles that together, with Government and partners, we can grow and sustain the turtle population at healthy levels across Fiji so harvest for traditional ceremonies like the installation of chiefs or death of our chiefs can be regulated and provided for. We can look at how we go in the near future and take appropriate decision. Together this is possible.” Mr Laitia Tamata he added. The Green Sea Turtle was released at 9am Tuesday morning. Youths of Kinoya accompany the endangered Green Turtle out to sea. 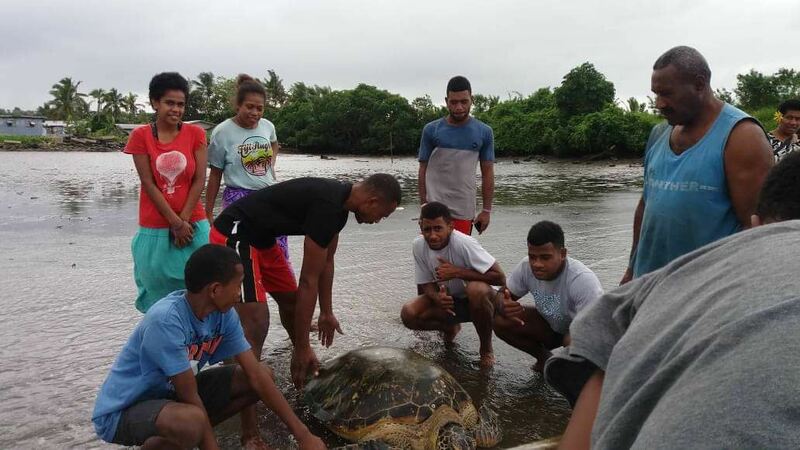 Youths of Kinoya village with village elder Apisai Tinakoro (blue vest) bid farewell to the endangered female Green Turtle.